I remember the first time I watched Secrets of a Restaurant Chef with Anne Burrell. She made pasta bolognese on that first episode and the reason I remember it so vividly is because even though Anne started her first show with a very simple recipe, her manifesto on that show and every show from that day forward was "brown food tastes good," imploring over and over again the need to brown your food for ultimate flavor. 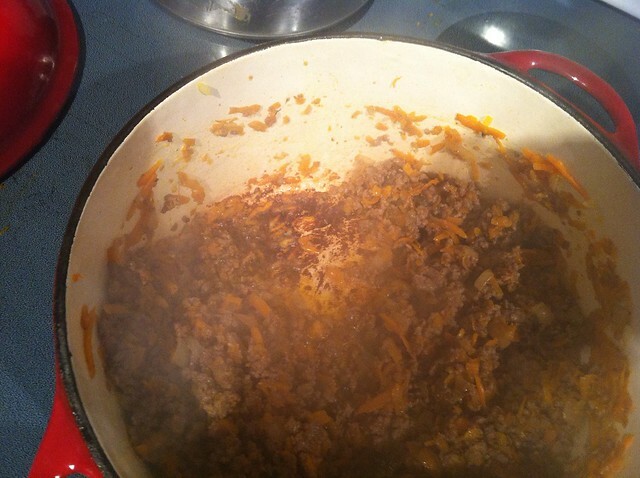 For bolognese, Anne says she was doing it wrong until she went to Italy and they told her that her vegetables weren't cooked enough. She thought they were cooked plenty, but they hadn't achieved that brown "gunk" at the bottom of the pan that is the base of all flavorings for sauce. So from then on, her mantra became "brown food tastes good" and she advises her viewers to brown the veggies in your bolognese almost to the brink of disaster. I don't follow her recipe to the letter anymore the way I used to, but I always make sure to follow that sound piece of advice. 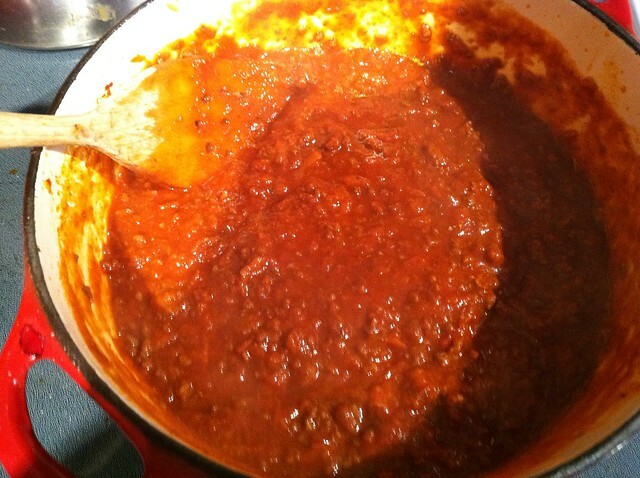 I haven't made a bad bolognese yet. I'd say this is close to the brink of disaster. Time to deglaze. Another thing I learned from Anne is that a bolognese is not a sauce and it shouldn't have a lot of liquid, so this will need to reduce down. Mmmm... now I'm hungry. Glad I have some leftover in the freezer. Looks yummy! One can never have enough bolognese in my opinion. This looks great and it is one of my favorite meals - always so satisfying. I will have to give this recipe a try. Thanks for sharing it. I agree withe Heather, I love bolognese. I wonder if I brown my veggies enough. oh gosh..now I am hungry too! I am slowly learning to brown things better. This looks delish! Anne Burrell is a local celebrity - her parents live here, and she often appears at local events. The recipe sounds delicious! That looks so good. Time for supper! This sounds fabulous, and I agree about the browning. 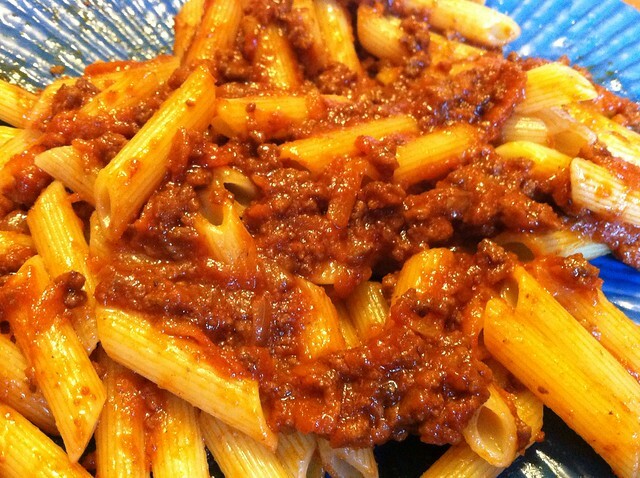 I use Marcella Hazan's bolognese recipe - it's fabulous too. Sure, brown is good as long as it involves chocolate,but with my veggies? I always use a non-stick pan and it's hard to brown in those. Might be worth trying a different pan for once to see what happens taste wise. Thanks for the sharing the link. Good tip! I tend to undercook for fear of burning.